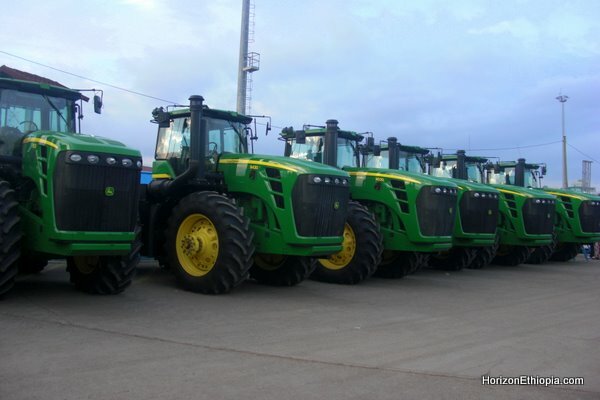 Addis Ababans were treated to the curious site lately of some really large tractors lined up at the NOC gas station on the very tip of Bole Road by the airport. So huge were these tractors that their tires were well beyond the height of all the pedestrians passing by them, agog with curiosity as to what they were and where they came from. Even one of these massive monsters would have been enough of passerby’s attraction but with 15 of them lined up at the already cramped gas station, the tractors basically dominated the skyline in the area and the curiosity driven conversation of the myriad passers by. These were in fact the property of Karuturi Global – an Indian firm engaged in a variety of agriculture sector investments in Ethiopia. In fact, Karuturi is perhaps the poster child for the big land grabs that have characterized large scale agricultural investment in Ethiopia over the recent paste. Its 300,000 hectare development in the Gambella region qualifies as one of the largest landholdings awarded to any company or individual in the country. With floriculture ventures in Ethiopia (since 2004), Kenya and India, the company is said to be the largest exporter of cut flowers in the world. It has recently stated its intent to move into a wider range of agricultural activities with its large landholdings in Ethiopia set to underpin its ambitions of becoming a major supplier of food commodities to the global market. The 425-475 horsepower John Deere tractors reportedly cost the company $10 million USD along with all of their attachments according to an official of the company in an interview with Fortune. Able to plough 75 hectares in a single day, they will likely be called upon frequently to help the company achieve what it vows to be as much as $1 billion in exports a year in the near future. Perhaps companies like this are what the government’s Growth and Transformation Plan is counting on to at least double exports in the next 5 year period.